What is it about ‘toy cars’ that make them so interesting? Why is it that we like to miniaturize our large, practical transportation machines, into small and essentially useless toys? And what does it say about us, when many people find the toy versions more interesting than the real thing? These are the kinds of deep, philosophical questions that need to be addressed. Instead, let’s just geek-out over the mere tyres of old R/C cars. Tyres are often the thing I love most about collecting vintage R/C cars. Even as a kid, I’d always notice the tyres first, trying to imagine them scrabbling around my backyard or over mum’s garden. How would they perform in sandy terrain? Or in a puddle? We all look at tyres and know they are the practical means by which a car maintains traction and propels itself. But when you’re 10 years old, those little tyres seem to hold even more promise – giving a vehicle it’s poise, as if filled with potential energy and ready to sprint to victory in some neighborhood race against your friends. To me, tyres have always been the most exciting part of any R/C car. Or at least, they used to be the most exciting part. Today, many modern R/C tyres are much more low-profile, less realistic and less interesting. In the 1970s and 80s, R/C car tyres were bigger, fatter, wider and generally more interesting. They looked like real off-road, dune buggy tyres. Even full-sized racing cars back in those days, tended to have bigger, fatter tyres. So naturally, the toys replicated that in miniature form. 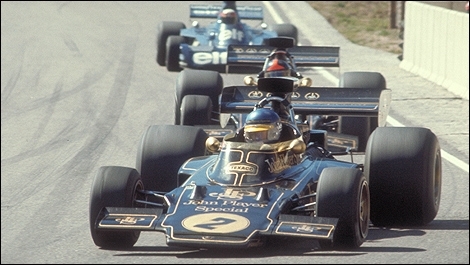 From buggies to Formula One, racing car tyres were chunky and somewhat more impressive to behold, than they are today. Of course when it comes to vintage R/C, those early tyres were usually less efficient and more prone to wear. But there’s a lot to be said for good looking tyres and wheels – because without them, even the best looking car designs can look pretty terrible. So below are 16 of my favourite R/C car tyres of all time. The list is ordered roughly according to favoritism. But to be honest, I love them all pretty equally. Naturally, this list will differ from your own personal favourites, so feel free to add your comments below. My list is mostly off-road tyres, simply because the demands of off-road racing usually meant bigger and more impressive rubber. The list is also mostly kit-based cars, mainly because those R/C kit makers were often (but not always) the most innovative designers. And lastly, the list is entirely vintage. For obvious reasons. I had to include these. 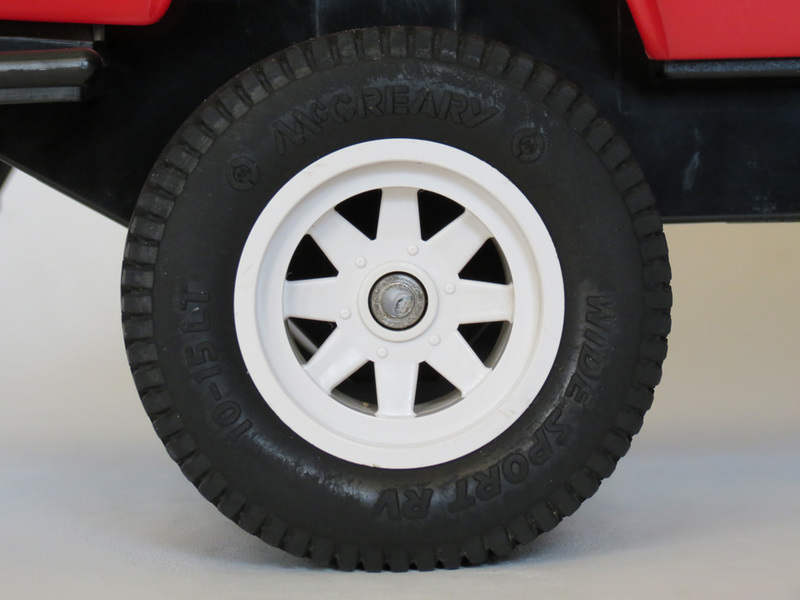 The 1/10 scale Nikko Toyota HiLux 4WD from 1982 featured these authentic ‘McCreary’ branded tyres – as part of their devotion to scale realism. Featuring good quality rubber that looks as if it will last forever, these tyres have a lovely, realistic appearance. They were never made available as spares, and did not appear on any other model other than the HiLux 4WD. I can’t think of another toy that has McCreary branded tyres. And it’s just nice that Nikko were willing to keep this model so authentic. 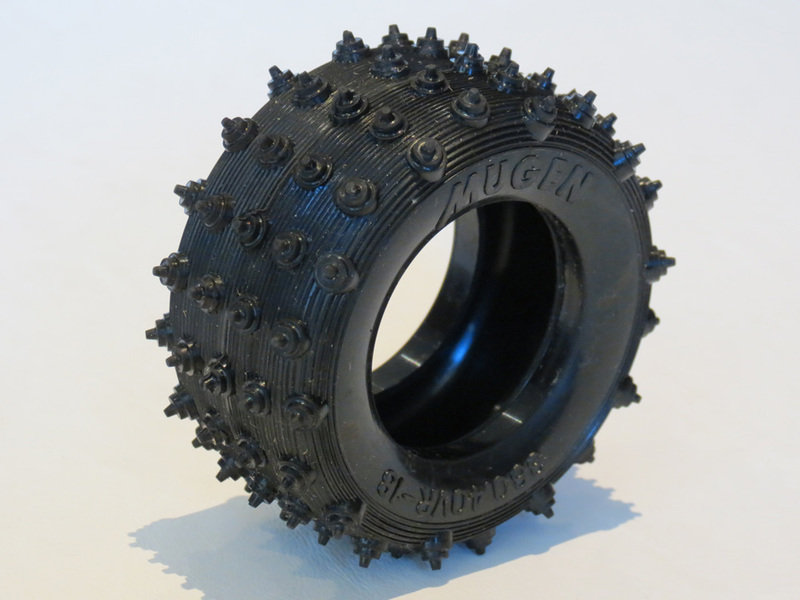 In the mid-late 1980s, most of Tamiya’s buggies came with either the Tamiya Oval Block or Tamiya Pin Spike tyre. The Pin Spikes made their first appearance on the muscular, and lethal-looking Tamiya Super Shot, and were also featured on the futuristic Tamiya Avante and Tamiya Vanquish. All of these cars had a muscular and aggressive look to them, and a lot of that appearance was thanks to these tyres. All three were also 4WD, and Tamiya basically reserved these tyres for inclusion in those kits, where high levels of grip were required. The tyres even feature “4×4” on the side. The concept behind these tyres was simple – sharp spikes = more grip. Tyre technology was limited back in those days, but combined with a relatively low sidewall (for the time), the Pin Spike was still an excellent choice of rubber in it’s day – at least while the spikes lasted. Unfortunately the wide spaces between the spikes meant that friction was being shared over a limited surface area and those little cones tended to wear down quite quickly. This was by no means a problem exclusive to the Tamiya Pin Spikes, as we will see throughout this article. But as tyre technology advanced, it’s probably what led to the Pin Spikes not being a standard kit tyre beyond the Vanquish. 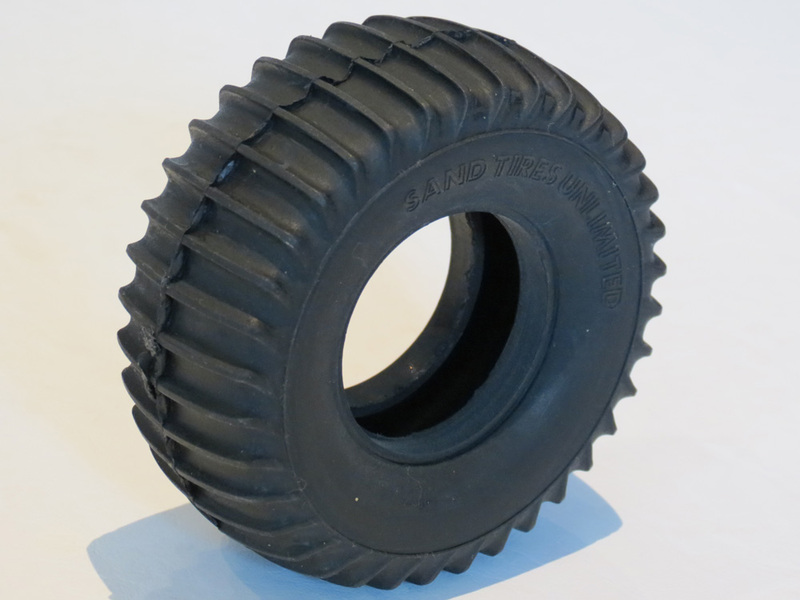 The venerable Tamiya Oval Block tyre can be found on many vintage Tamiya models released between 1985 and 1990. They first appeared on the Hotshot – which being 4WD, meant they were used at both front and rear. And they were later included on several of Tamiya’s subsequent 4WD machines – the Boomerang, Super Sabre, Hotshot II and Bigwig, and even a couple of the 2WDs – the Wild One and the Fox (both at rear only). 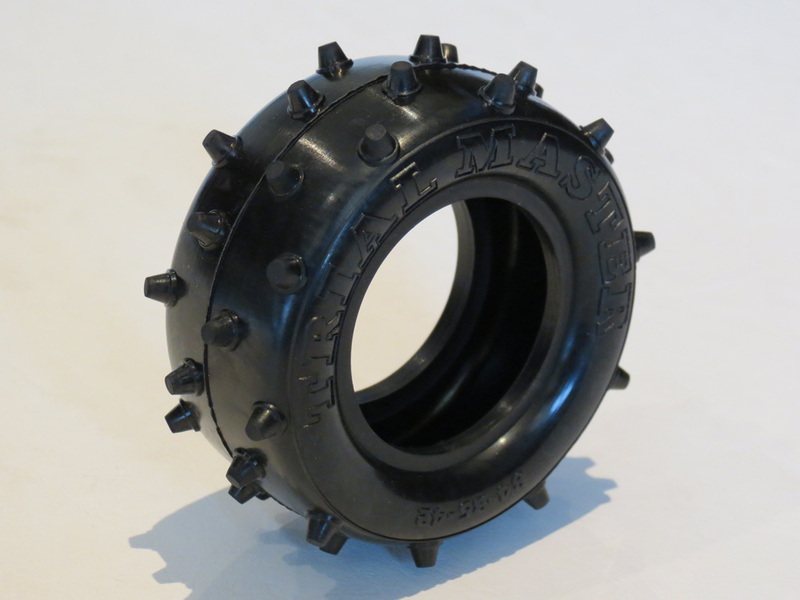 Much like the Tamiya Pin Spike, the Tamiya Oval Block was a hard compound tyre with a relatively low sidewall for it’s time, to avoid deformity during cornering. But unlike the Pin Spike, it had the benefit of a more balanced tread pattern – a mix of spikes and block shapes. These blocks were even arranged in such a way that the tyre had a preferred direction of rotation, as indicated by the “Drive –>” lettering on the sidewall. Overall, the block pattern offered reasonable grip and more surface area, for longer wear. This made it good value as the standard kit tyre for many cars. Sometimes these tyres were tough to fit to the rims though. Try fitting lots of them in one sitting, and you’ll just about wear your fingers off! My first ever memory of the Tamiya Oval Block tyres was actually buying a set from a hobby shop with about $10 of pocket money, to fit on a really old and broken Tamiya Hotshot I was trying to restore. 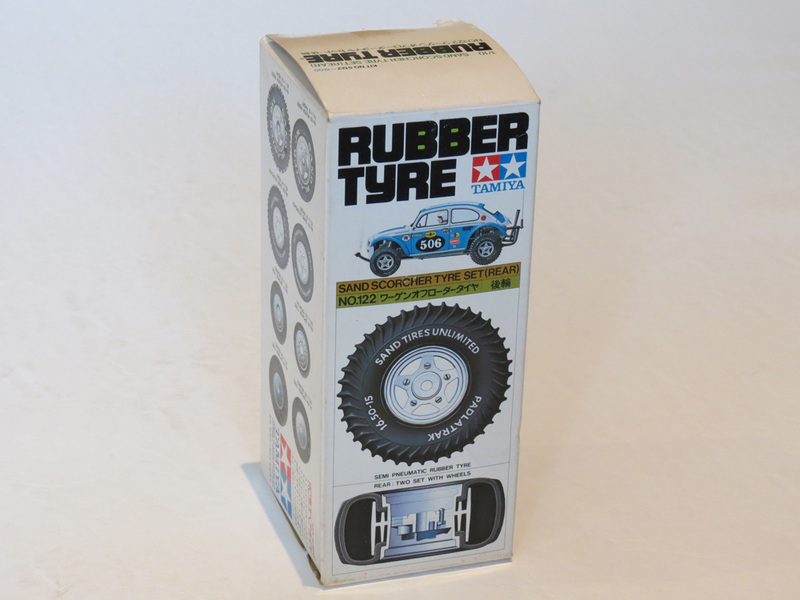 Now of course, just the smell of that vintage Tamiya tyre rubber always takes me straight back to those days. The only tyres in this list that you can actually pump up with an air pump. Shown here on the rims, these tyres could be found on several early Kyosho models, but most memorably on three cars called the Volkswagen Baja Bug, HiLux Pickup and Sand Skipper (I’ve named the tyres after the Bug). These cars were early, affordably-priced off-roaders designed with the ability to traverse water and handle soft dunes. Today, due to their early retro looks, they are quite rare and valuable – as are the tyres they used. Running these cars over dunes is I suppose where the inflation/deflation feature was intended to come into play. With their tall side-walls and small blocky tread, deflating this tyre to flatten out the surface area in contact with the sand and, in theory, this could actually help the vehicle traverse deep dunes. It was a fiddly, but charming feat of miniaturization that kids would have loved, at least those few who had access to these early Kyosho classics. Pumping up is done with an included finger-pump, and you basically push the sharp pin valve into the tyre (creating a tiny hole) and squeeze the pump over and over to inflate it. The inner wall of the tyre tends to seal up the hole you created, once the pump is removed (although a bit of rubber glue might also be used). These are possibly the tallest and most “balloon-like” off-road tyres I’ve ever seen. 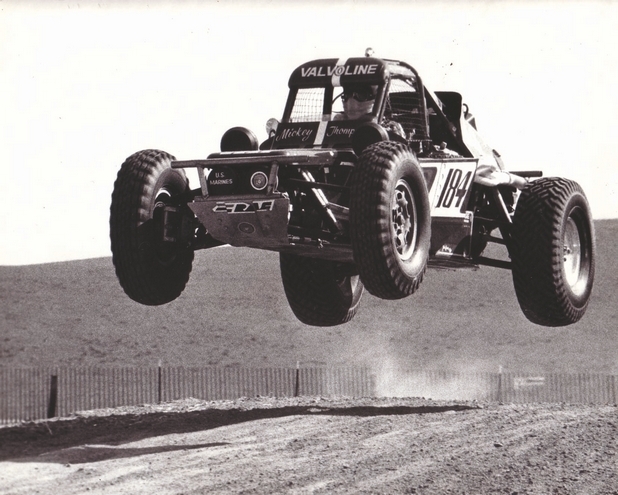 Very authentic to the era of the 60s or 70s, when sand dune racing was a popular sport. The Hirobo Zerda was a kit-based 4WD frame buggy that made a splash in 1985, just as 4WD cars were beginning to swamp the mainly 2WD competition circuit. 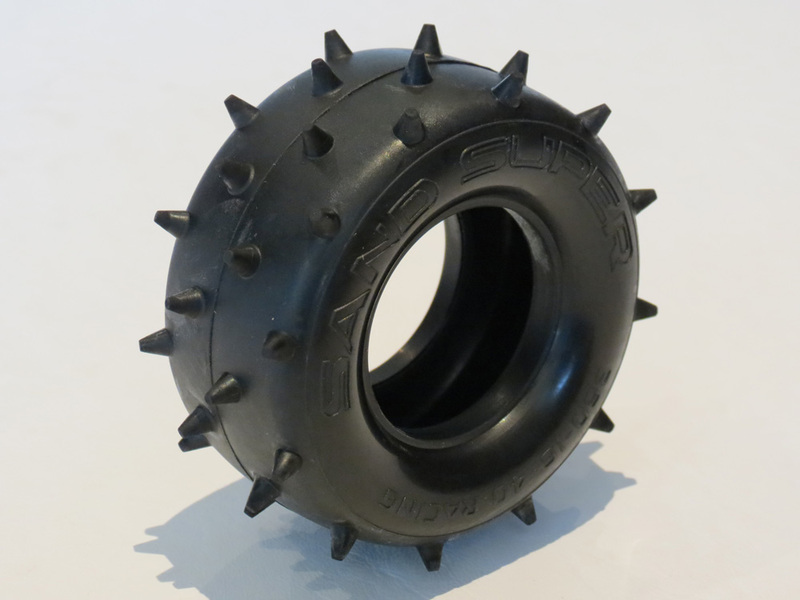 Zerdas were quite competitive in club racing for a while, and the standard tyres they came with (this tyre was used at all four wheels) showed the typical design thinking of the time – large dirt-digging spikes with large gaps between them. I also love the “Trial Master” side lettering. I’m lucky enough to own a Zerda, and while I haven’t actually driven it yet, I can only assume that these tyres would wear down fairly quickly on anything but dirt. That said, they do not have the most extreme spikes of the examples on this list, so their durability would have been better than some. Much like the Zerda itself, these tyres are quite rare, but I did manage to find some leftovers in a hobby store a few years ago – a very lucky find given that they have not been manufactured since the 1980s. Shown here on the Golden Arrow rim, these are the rear tyres of that popular 2WD buggy from Tandy/Radio Shack (manufactured by Nikko). Technically you might say they first appeared on another Nikko buggy, such as the Bison or the Rhino, but the tyre pictured above is actually from a Radio Shack spare parts packet (it even came with a instruction sheet for fitting them). Yes, Radio Shack did once offer R/C spare parts for cars like the Golden Arrow, but only via special order. For those of us who could only dream of owning a Tamiya in the 80s, the equally expensive Golden Arrow was sometimes a better choice to convince your parents to shell out their hard earned cash. Being ready-to-run and coming with it’s own transmitter, it was an easier option for many. 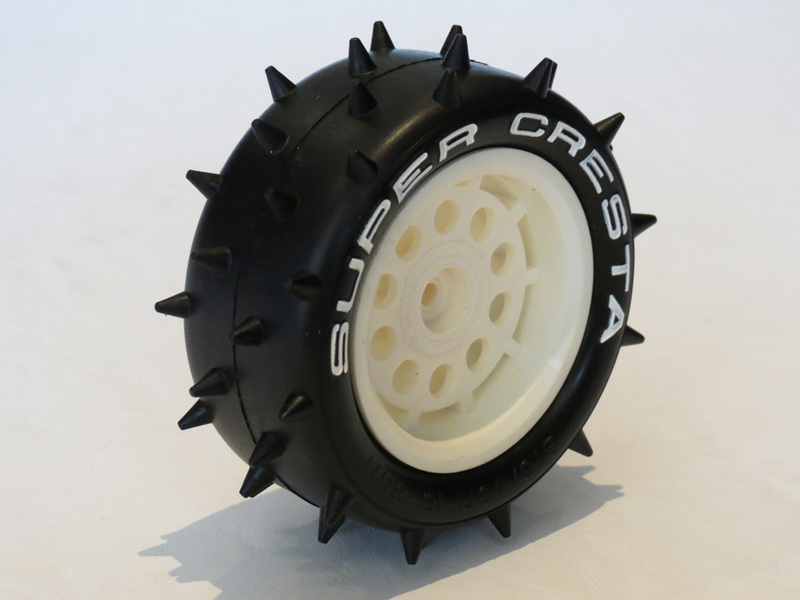 And being a fairly standard 2WD, 540-motor powered buggy, the rear tyres were similar to the Buggy Spike Tyre from Tamiya – lots of spikes, running around a fat, balloon profile (with some of the spikes sitting out almost horizontally at the edges). I loved the look of these tyres, just as I loved all the fat buggy tyres from Tamiya. As always, these tyres would wear out very quickly when running on bitumen or concrete, but on dirt they were a solid performer. Several of Tandy/Radio Shack’s subsequent 540 powered buggies also used this tyre, as did several Nikko buggies. 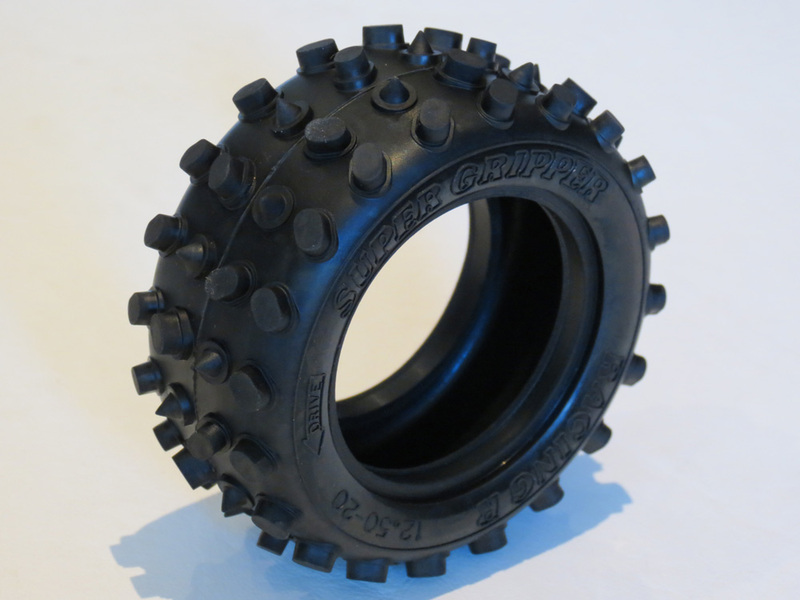 These tyres were standard issue on a number of 1980s Kyosho buggies – across both 2WD and 4WD. 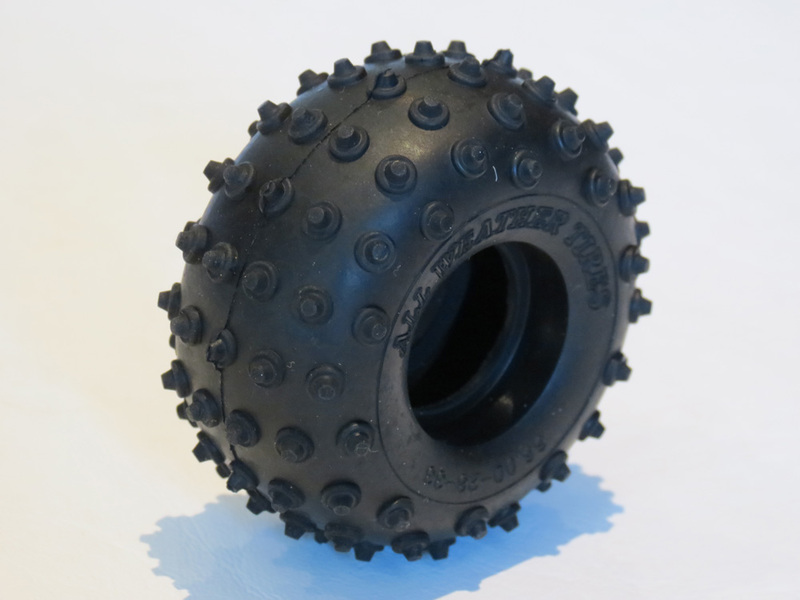 They look like slightly smaller copies of the Tamiya Buggy Spike Tyre, except that each spike has an intricate triple-tier shape, almost like little Devo Energy Domes. Some of the cars that used these tyres include the Kyosho Gallop and Gallop Mk II, Progress, Pegasus and Icarus. Again, these are basically cool to me for being so fat and rounded – and the sidewall “Mud * Star” lettering looks particularly great when painted, as shown on much of the vintage Kyosho kit box art for the cars that used these tyres. In the mid-1980s, Kyosho seemed to move from blocky patterns, to more spiked patterns, and these tyres were featured most notably on the Kyosho Turbo Scorpion – their revamped new version of the Scorpion, as well as the fuel-powered Kyosho Assault buggy. This is another tyre that could only exist in the 1980s – tall, narrow spikes, sparsely populated across a fairly fat profile. As always, these tyres will deliver all-or-nothing grip – great while it lasts, but nothing once they wear down. They have the second tallest spikes of any tyre in this list, and to me they just look ready to rip-up the surface of any dirt racing track. 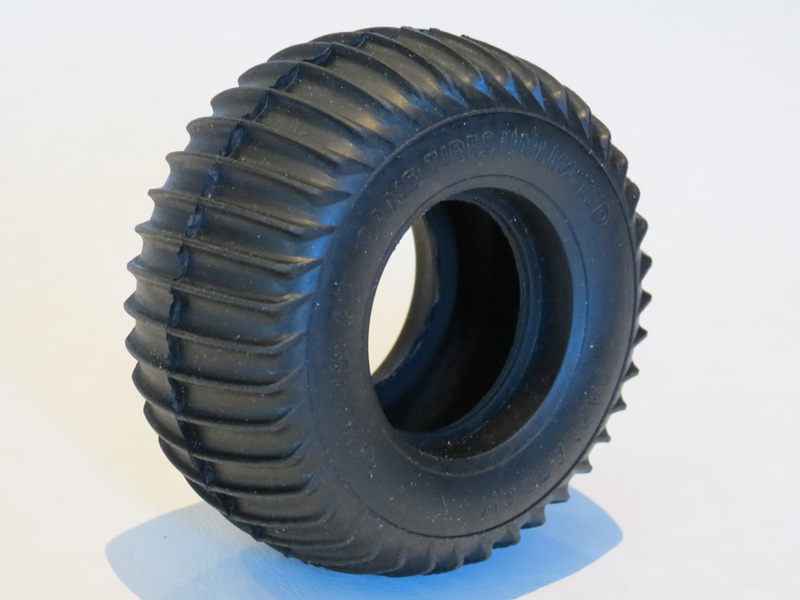 These are the smallest tyres in this list, and are for the Taiyo Jet Hopper – a ready-to-run buggy that captured a huge market in the mid 1980s and also sampled a cheeky collection of ideas from other more expensive R/C vehicles. 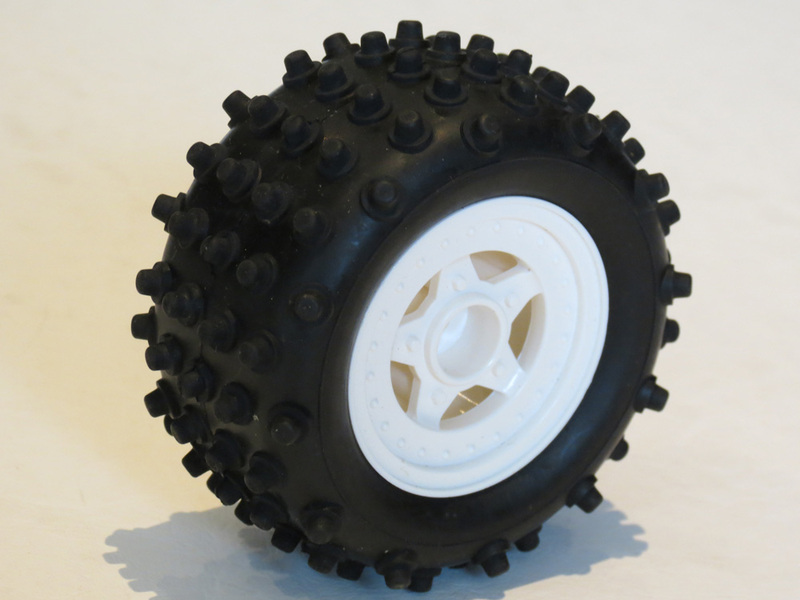 One of the items copied was the rear tyres, which were like perfect miniaturized copies of Tamiya’s Buggy Spike Tyres. Of course, they also had the effect of giving the Jet Hopper a similar ready-for-the-dunes fat-rear-tyre look, just as Tamiya had achieved with it’s Frog, Super Champ and Hornet. 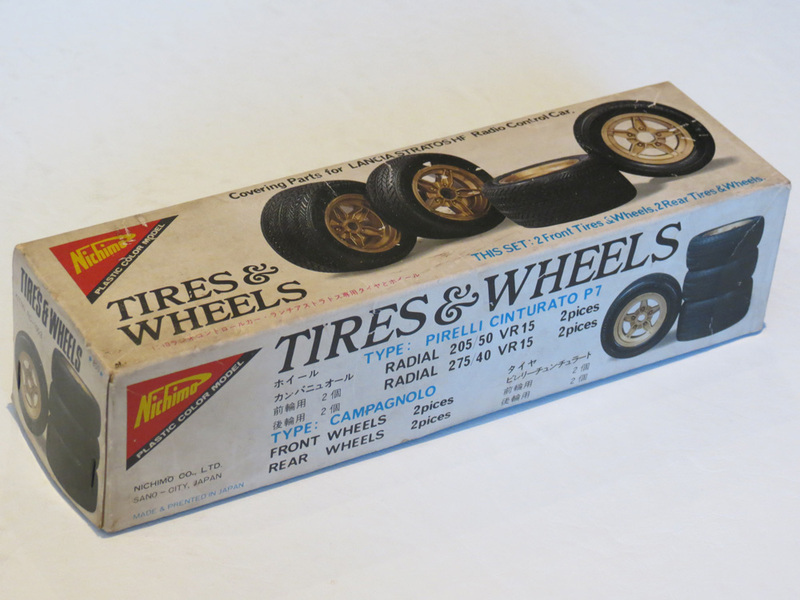 Unlike most ready-to-run R/C toys, Taiyo actually did sell these tyres as spare parts to help support their vehicles during those popular years. Thanks to the Jet Hopper’s lack of a rear differential though, the vast majority of the examples left in the world are now worn out, and spares are quite scarce. To make matter worse, the rubber compound they were manufactured with has been known in some instances to deteriorate and crumble over time (even in the packet). So you’re very lucky if you still have a vintage Jet Hopper with these tyres in workable condition. Be sure to look after them. 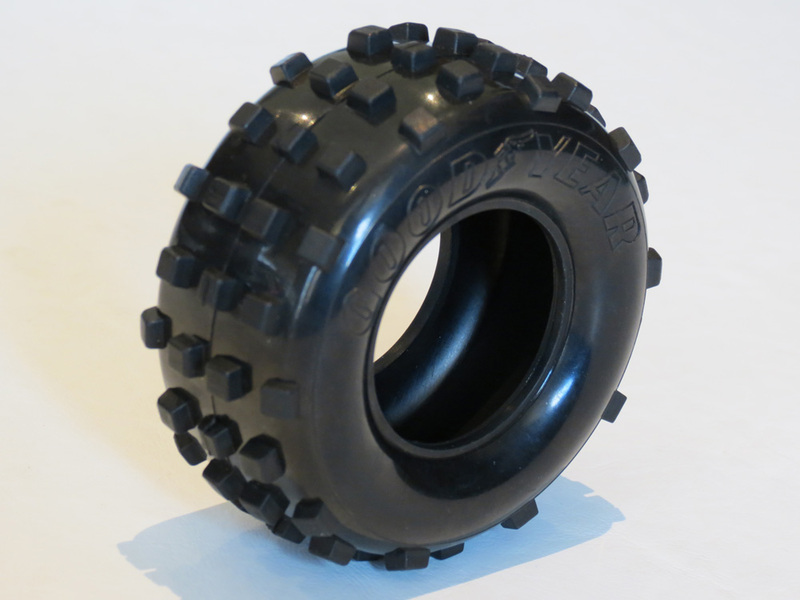 Speaking of rare, here’s the Tamiya Wild Willy tyre. 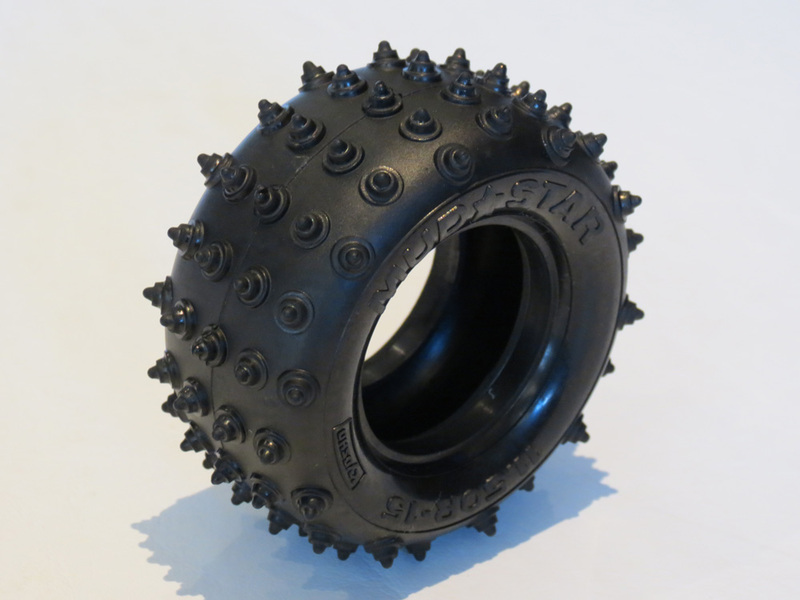 You might also know it as the Tamiya Blazing Blazer tyre, as these were the only two Tamiya models that used it. Made from quite a soft compound, these bouncy tyres were actually supported inside by an inner piece of foam. Featuring a paddle-style tread, they were designed to suit the slow crawling of the Blazing Blazer and the bouncy, crazy action of the Wild Willy Jeep. Both of these cars used the same tyre at all four wheels. The tyres themselves look like larger, taller versions of the Tamiya Sand Scorcher Rear Tyre, but in fact they seem to have been made from an even softer compound. Nevertheless, their uncomplicated tread pattern tends to mean they last quite a long time no matter what surface they’re running on. Today these tyres are very rare in brand new form, and the price for a single brand-new pair can be very high. When it comes to collecting kit-based R/C buggies from the 1980s, there are few cars that are more exotic, expensive or harder to find nowadays than the AYK Viper. AYK (Aoyagi Metals Co Ltd) is an R/C brand that is no longer with us, but they made quite a few on and off-road vehicles during the 1980s and were even successful in competition. The Viper was released in 1986 – a lethal looking, heavy, metal-framed machine with four tyres that had just about the tallest spikes you will ever see. The spikes are sharper and longer than anything else on this list, so that only means two things – they offered great traction while they lasted, but they didn’t last long. You may never own a Viper so, as I once saw the editor of a sports car magazine say in relation to the Bugatti Veyron, “be thankful that it exists”. As for these tyres – they are among the rarest R/C spare parts I know of. Few collectors of the Viper would even dare run their car with these original tyres fitted these days – for fear of never finding a new set. 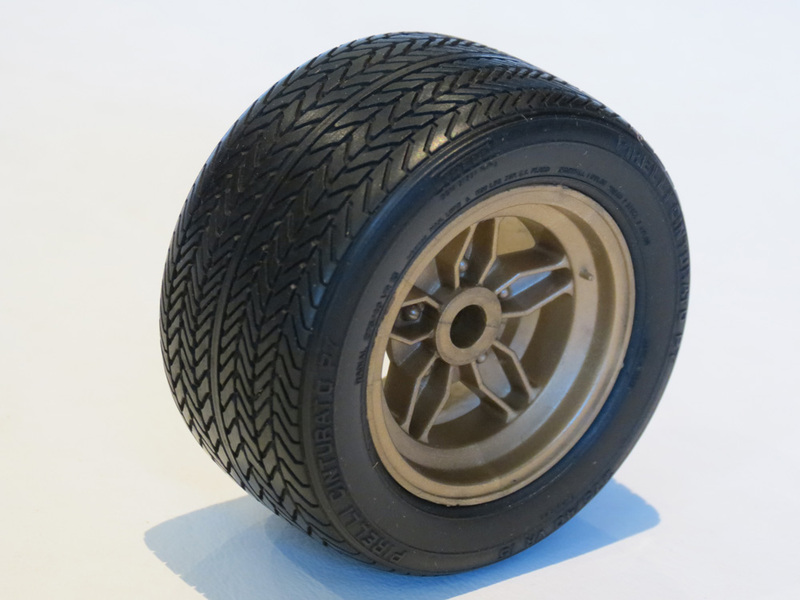 Similar to the Kyosho Turbo Scorpion Tyres, but with an even block pattern all over them, these tyres were an earlier release from Kyosho that first appeared (as far as I can tell) on the Kyosho Scorpion, their top-line 2WD racing buggy of the early 1980s. They also appeared on the Kyosho Beetle and Kyosho Tomahawk, and perhaps one or two other vehicles. The main reason I love these tyres is because they initially had “Goodyear” written on the sides, which just looked super cool on the Scorpion, Tomahawk and Beetle – three of Kyosho’s greatest ever releases. It’s always nice to have real world tyre branding on toy tyres, but I guess their allure was increased when Kyosho dropped the “Goodyear” lettering and replaced it with “Sand Super” on the same tyre. Today, the earlier “Goodyear” versions are much sought after for box-art authenticity when building these cars. Most recently, Kyosho hopped on the re-release bandwagon, reissuing the 1980s Scorpion kit. But as with all reissues, the new car carries a myriad of differences from the original release – one of which is that the new tyres feature a more dense pattern of blocks. Proof yet again, that only the original issue of any R/C car is the truly vintage version, and everything else is just pretending. The Tamiya Sand Scorcher is for many, the most famous vintage R/C car – an off-road VW Beetle with gorgeous scale detail. It’s classic tyre combination of rear “Padlatrak” tyres and front “The Smoothee” tyres is known to many. 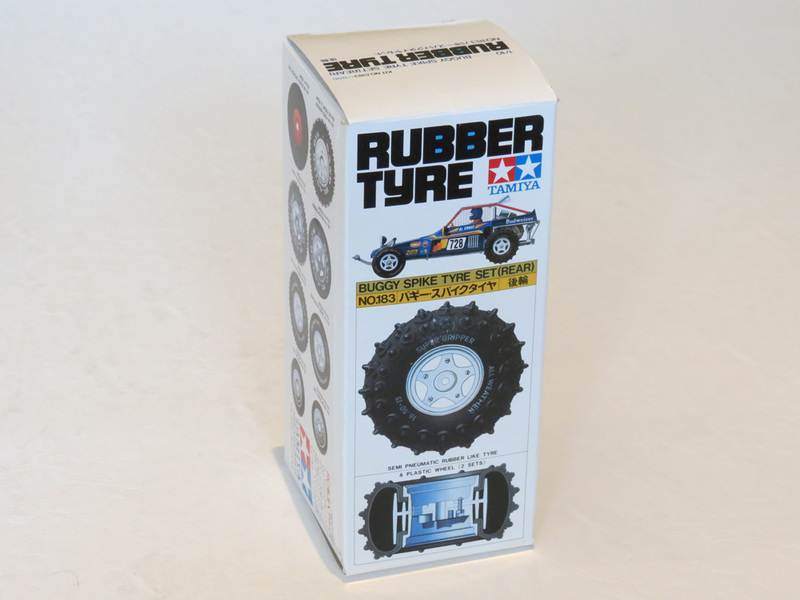 Back in those early days of the 1970s and 80s, many Tamiya spare parts (such as tyres) used to come in beautiful, coloured boxes like the one shown above. Tamiya would even name spare parts after specific cars – hence these are literally “Sand Scorcher Rear Tyres”, and they feature a coloured illustration of that car on the box. Today, all of that seems like a quaint, lost art. Spare parts are given boring, generic codes, and indexed across dozens of boring cars. But we can still appreciate the way things once were. The first time I ever bought a set of Sand Scorcher tyres, I was lucky enough to come across a box filled with them at a hobby store. Not having much money to spend, only bought one front and one rear set. But I remember thinking how beautiful the boxes were, and what a quality experience it was to own, restore or maintain an original Tamiya buggy. These Sand Scorcher Rear Tyres were only kit-standard issue on the Sand Scorcher and the Grasshopper – two cars with moderate levels of speed, and designed for fun afternoons of paddling through sand dunes, and as such they were perfect. They do not offer much in the way of sideways-traction, but sideways slides and over-correction are all part of the charm of vintage R/C buggy running! Growing up in the 1980s, I was lucky enough to find a mere photo of a Mugen Bulldog II at one point, and was immediately obsessed with it’s blocky body shape, the talk of it’s 4WD and 4WS (Four Wheel Steering) ability, and yes – these unusual tyres. Featuring a very square profile, lots of longitudinal grooves, along with a myriad of multi-tiered spikes – these tyres look complex and unique. They were used at all four wheels of both the Bulldog and Bulldog II, which were both 4WD and 4WS. 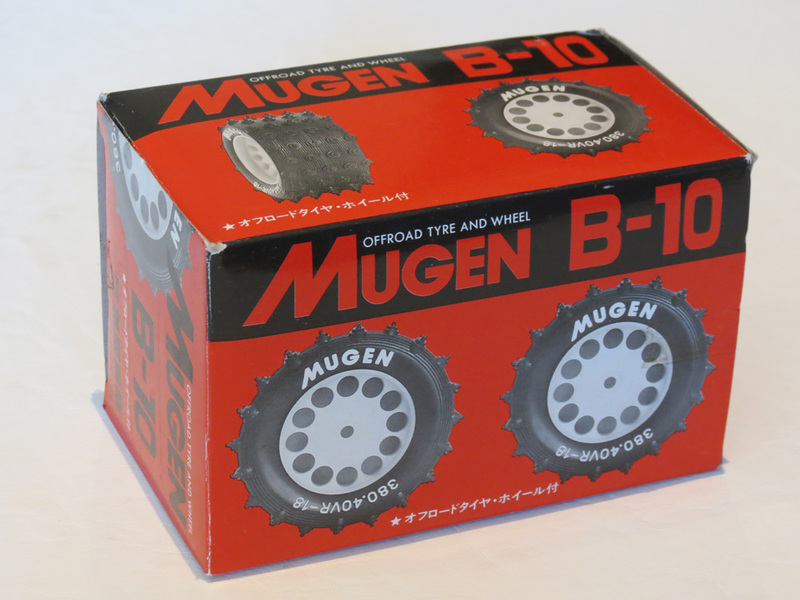 Mugen was a Japanese company whose Bulldog buggies of the mid 1980s were highly competitive, and the company still exists today as a maker of petrol powered 1/8 scale machines. However, they no longer resemble the brand they once were, as back in the 1980s they were one of many electric buggy makers offering unique and creative cars that were clearly devised with a lot of care and enthusiasm. Nichimo was a Japanese company that made plastic model kits, but entered the world of R/C in the late 1970s – a couple of years after Tamiya. The Lancia Stratos was possibly their first ever R/C car, and the kit was approached with a level of slavish attention to detail that only a master manufacturer of plastic models could ever produce. In the late 1970s, electric R/C cars were mostly on-road vehicles, and Tamiya was having great success with their various R/C Porsches and Formula 1 racers. But it was Nichimo who first decided to tackle the exciting Lancia Stratos rally car. I have actually heard rumours over the years that, due to Nichimo’s incredible 1/10 scale Lancia Stratos kit, Tamiya decided not to bother producing their own R/C Lancia Stratos – the suggestion being that the model had already been recreated to the highest possible standard. I must stress though, that this story is just a rumour – but if true, it says something about the standard of the model produced by Nichimo. To this day, Tamiya has never released a 1/10 scale R/C Lancia Stratos – quite strange, don’t you think? In assessing the quality of Nichimo’s model, the tyres alone give the game away. Nichimo seem to have decided that they were going to miniaturize, perfectly, the Pirelli Cinturato P7 tyres often used on the real Lancia Stratos. The tyres feature laser-accurate tread patterning, and almost microscopic sidewall writing that details every aspect of tyre – just like the real tyre. Right down to it’s materials composition, technical measurements, and other ID codes. The lettering is literally so small that you will need a magnifying glass to read it all – but it’s definitely there. Astonishing! And just check out the beautiful box that this tyre set came in. Don’t you wish you could walk into a hobby store today, and buy spare parts for your scale R/C racing car that looked like this? 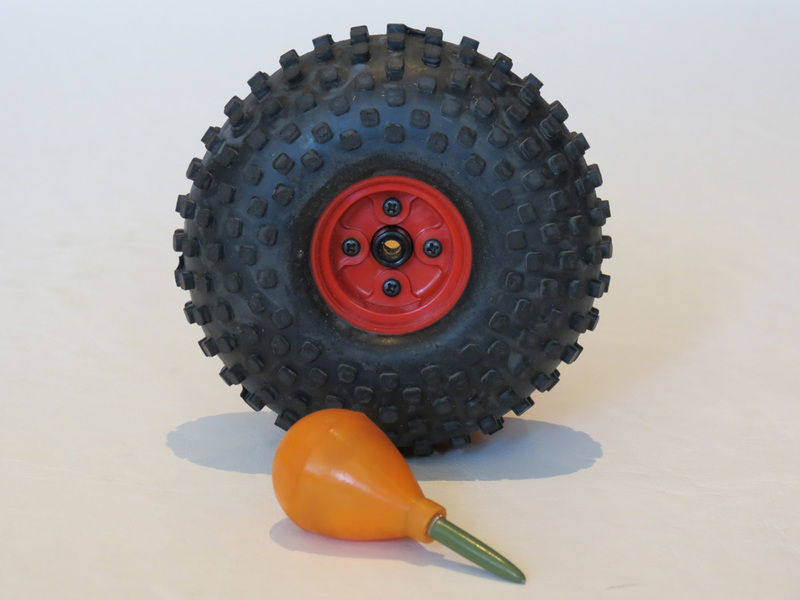 When Tamiya released the Super Champ in 1982, they gave it these fantastic spiked balloon rear tyres that, as a young kid, were more alluring to me than the tyres of any other toy car I had ever seen. Designed to fit the early, small diameter 3-piece rims used by the Super Champ (and other iconic models like the Frog, Hornet, Sand Scorcher and Grasshopper) these tyres are so fat that they tend to squash a bit flat under the weight of these buggies – even as they stand still. And as a young lad looking through the old Tamiya catalogues of the 1980s, there seemed to be nothing cooler than having their crazy spiked rubber balloons at the rear of your car, to blast it along dirt trails. The first Tamiya I ever owned was an old Hornet that was handed down to me, but which did not have it’s original tyres anymore. And there was actually a time in the early 1990s when I rang dozens of hobby stores looking to find a spare set of the original rear Buggy Spike Tyres – to no avail. This was in the days before the internet, and many old spare parts had been discontinued and the local stock had run dry. Years later, thanks to eBay, I was able to finally get my hands on many brand new boxed sets of these tyres, and at first I just held the damn things and stared at them – glad to have finally found them, thanks to leftover stock from around the world! I’d been staring at these tyres in the Tamiya catalogues for the better part of a decade, and I can’t tell you how great it was to finally have some original, fresh sets to fit to my buggies. Much like the Sand Scorcher rear tyres, the Buggy Spikes hail from the era when Tamiya sold spare parts in beautiful coloured boxes – this time featuring an illustration of the Super Champ on the side. 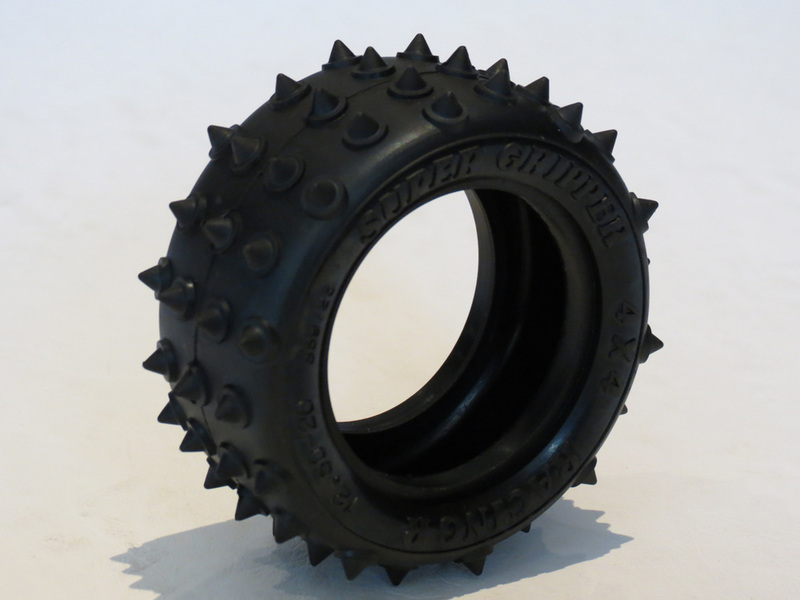 In my opinion, there’s no tyre more quintessentially “Tamiya” than the Buggy Spikes, as they belong on three of the most important cars in the company’s history – the Super Champ, the Hornet and the Frog. These tyres have since been reissued, but it’s well worth getting a set in the original box if you can – just to experience the fun of restoring an old buggy with brand new, high quality, vintage tyres like these. It’s what the hobby is all about. Thanks for reading this long article, and feel free to write in the comments section below, and tell us about your favourite R/C tyres. After looking back over this list, I am undoubtedly biased toward buggies! Excellent topic! Weird as it is to those outside the hobby, the smell of those tires hitting one’s nostrils upon cracking open a vintage Tamiya kit is heavenly. You picked some great ones for your list. Tires were such an important part of an early kit’s personality. The Super Shot for instance looks all the more aggressive with those Tamiya Pin Spikes on all four corners. They look ready to tear into the earth. If I had to add to list, I’d consider the treaded tires that debuted on the rear of the Rough Rider and were later found on the FAV and Brat. They seemed so realistic to me when I was a kid. Some front tires like the Tamiya Smoothee are noteworthy too. I know monster trucks can be more of a US staple as they were “born” here but there were a few unique variations on the basic “terra” or “lug” pattern they commonly sported. The Monster Beetle tire seemed impressive at the time for stacking pin spikes on top of the tire’s lugs. 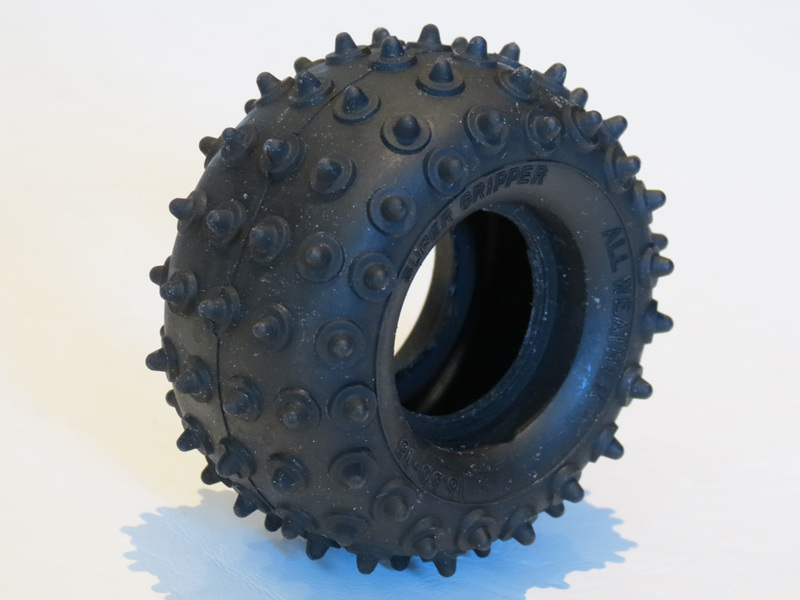 Of course no truck tire may be more iconic than the Clod Buster’s rubber thanks to its sheer size. This article was a great look at one of the most important parts of an RC vehicle. You’re completely right about the Clod Buster tyres Saito. My list could have gone on forever, but due to their formidable size (especially at the time of their release in 1987 when there was no other truck like the Clod Buster), they are very noteworthy. Thanks for the comment! Great article! I was thinking that Tamiya’s Willy’s Wheeler had some memorable tires in the form of their Advan HF types, which were only ever fitted to that one car. Their Michelin TRX rally tire for the Audi Quattro, Opel Ascona, and Lancia Rally also deserve some mention for duplicating the style and pattern of the real deal if not the proportions – all four of those vehicles were a little more like caricatures of the real thing, but lots of fun nonetheless! Very good point, another beautiful scale-like tyre that I probably should have included. Thanks EL! Such a great write up on vintage tires, you’re writing is excellent btw! I have to agree that the Tamiya buggy tires were very cool and had a certain charm to them. I remember they smelled really good too. (ha) They had that squishy, under inflated characteristic as well that (in a naive kid’s mind) seemed to translate to unlimited traction in dirt. Another favorite were the tires on the Kyosho Optima. I got that car for Christmas in 1985 and wow, what an absolutely beautiful car. The box art was beautiful, I just stared at it and all the gorgeous colors, of course those tires were so wicked with the tall spikes also. A bit off topic but I have to say I was not that impressed with the performance of the Optima, it broke fairly often and I believe the chain created a bunch of drag that probably diminished it’s performance. It’s still the best looking vintage RC car to date, IMO. For me the tires are one of the most important things in a kit, too. I remember as I got my Lunchbox…I was flashed by their size and their soft compound. 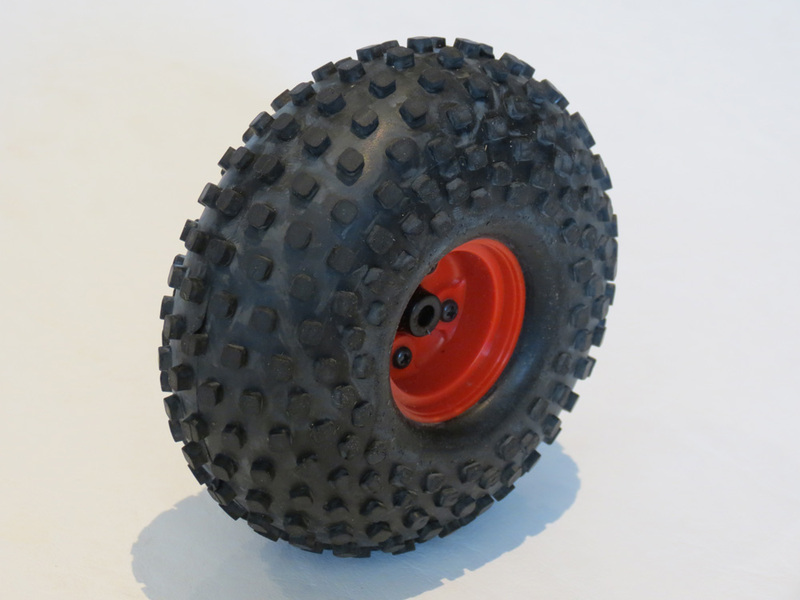 The buggy spike tyres of Tamiya changed over the years. My original vintage Super Champ has them in the first version. Later Tamiya put holes in the tires so they’re softer and don’t bounce that hard anymore. In fact before they decided to put holes in their tires, racers around the world drilled them on their own to get more grip.